Finding a great birthday gift can be so hard! What do you get for a senior who has everything? Your choice is doubly important when it's for a "big" birthday, like a 60th, 70th, 80th, ... you want it to be so special! Or how about a child's first birthday? They probably already have plenty of toys, so something the parents will appreciate is great, but again, what to get? And then there's co-workers - you don’t want the birthday gift to be too personal or too boring. So many people just like you have struggled with these difficulties when it comes time to buy a birthday gift. Well the good news is: this is the end of your search! The Birthday Report is a truly unique keepsake gift that will be enjoyed by young and old for years to come. I mean really, do you know anyone who would not be interested in knowing	what happened the day I was born? That's what makes this gift so perfect: you can't miss! Our customers have given this birthday gift for all ages, literally from 1 to 100. 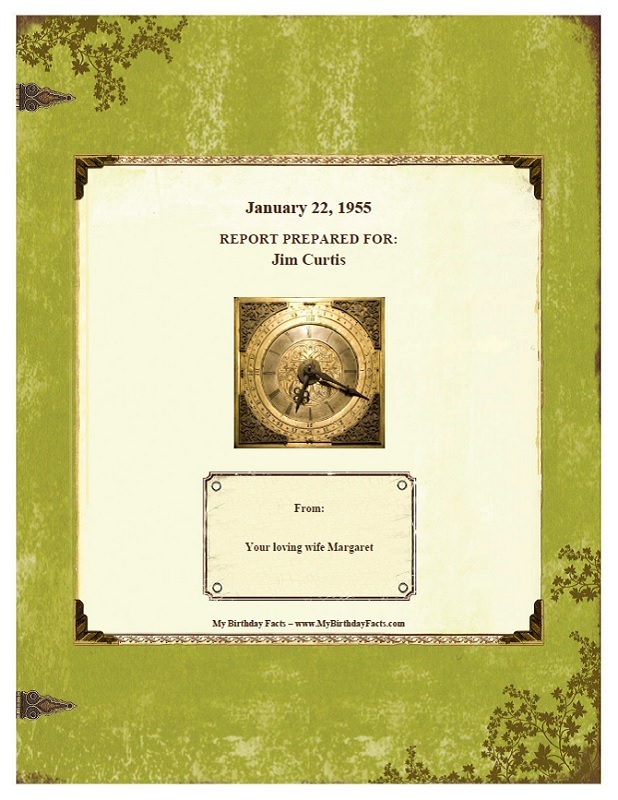 Starting at just $24.99, the Birthday Report is also a very affordable birthday gift. Who shares my birthday? 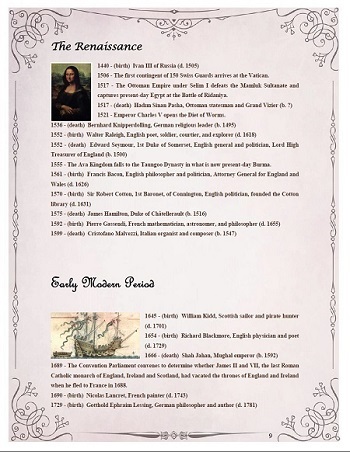 Famous people with my birthday. What happened the year I was born? A gift should always make this happen! 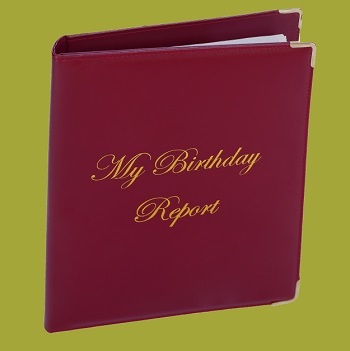 With nearly 500,000 facts in our database, everyone's birthday report makes for a captivating read! 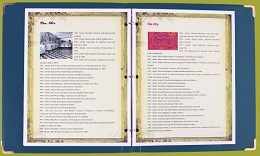 The digital report is emailed to you as a PDF file attachment. This elegant synthetic leather binder, with its gold pressed lettering, will be a treasured keepsake for years to come. 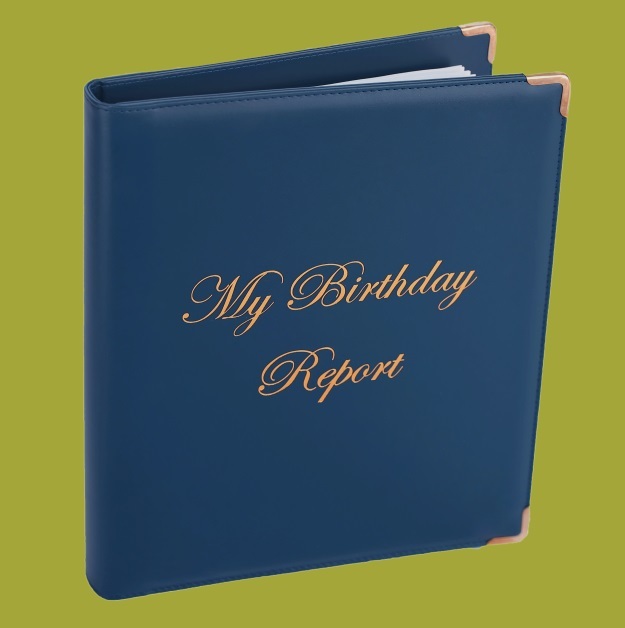 Gold colored metal corners add that extra touch of sophistication to your report. You can choose from three cover colors: a rich, majestic bordeaux, a classic refined steel-blue, or an executive black. The report is printed double sided on high quality 28lb paper (40% thicker than regular paper!). We mail it either to you or to someone that you specify. A receipt is sent to you by email, so that the gift recipient will not see the purchase details. First choose a photo to upload, and then click on the Upload button. If your upload was successful, you will see your photo below. Note: If the above Upload button is disabled, it is because your device does not support file uploads. If you still wish to use a custom photo, either use a laptop/desktop to place the order, or proceed with the order now and email us the photo after your order is complete. Please be sure to include the person's name so that we can match up the photo with the correct report. Set the recipient's birth date. Optionally add a personal event to announce the person's birth. 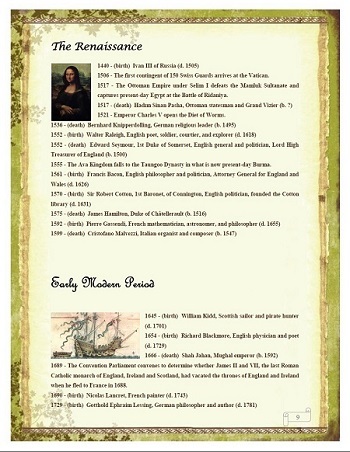 It will be added with the other historical births for that decade. 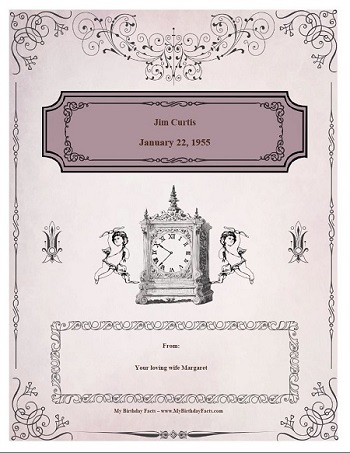 For example "Jim Curtis, cabinet maker and renowned fine woodworker." Would you like to add a personal event? You can add up to six guest sign-in pages. These are great when you are giving the gift at a birthday party, it gives a place for guests to sign and write their own birthday greetings. 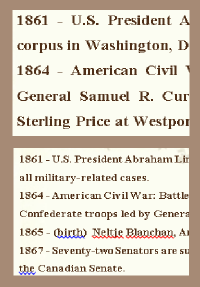 A large print edition is available for people who have difficulty reading standard sized text. Note that this will increase your number of pages by about 40%. Would you like large print instead of regular print for an additional $9.99? No thanks. Yes, send me large print instead of regular for an extra $9.99! You can make your report spill and tear proof by adding page protectors. 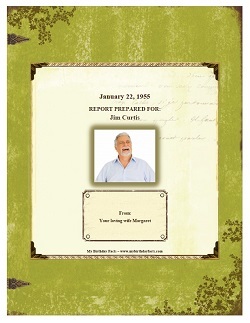 Each page of the report will be slipped into its own clear plastic sleeve, adding to the durability of the report. Would you like us to add page protectors for an additional $9.99? No thanks. Yes, add page protectors for $9.99! The above times are for shipping only, they do not include our processing time to prepare the report. Often we can get the report processed within 24 hours, but please allow up to 4 additional business days before we ship the report. Please note that these are the expected shipping times, they are not guaranteed. We are not responsible for postal service delays. Please click below to make your payment and specify your email address and, for printed reports, your shipping information. Often we can get the report done within 24 hours, but please allow up to 4 business days for delivery of your electronic copy of the report. Please check your spam folder during the next few days in case the email was incorrectly labeled as spam. The report will be sent to the email address that you specify when checking out with our payment processor. For printed reports, please allow additional business days based on the shipping option that you chose. You will be able to specify the shipping address in the payment form. Most of the time we can process your order within 24 hours. If we are swamped though, we ask for your patience and please allow up to 4 business days. If we see that the birthday is coming up within the next few days, we will automatically prioritize it and do our best to get it to you in time for the birthday. If you are ordering a digital report, you will get it immediately once we finish it. 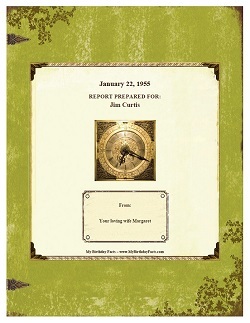 If you are ordering a printed report, please also allow for shipping times in addition to the above processing time. You will have the option to pick standard or express shipping during the order process. Please feel free to email us first (at ) if you want to know if we can handle a priority order. 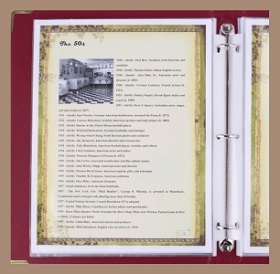 We can almost always accommodate your request, and at no extra charge. If you would like to make any changes to the report format, please let us know before ordering the report. We will happily accommodate small changes (adding/removing text, etc) for free, or give you a quote for more involved customizations. Take a look at our sample report to see if there are changes you would like. If you are not satisfied with your report for any reason whatsoever, just tell us why (we're always looking for ways to improve!) and we will then refund you the full purchase price, minus shipping charges for a printed report. Are you looking for unique, personalized birthday gifts for your staff? 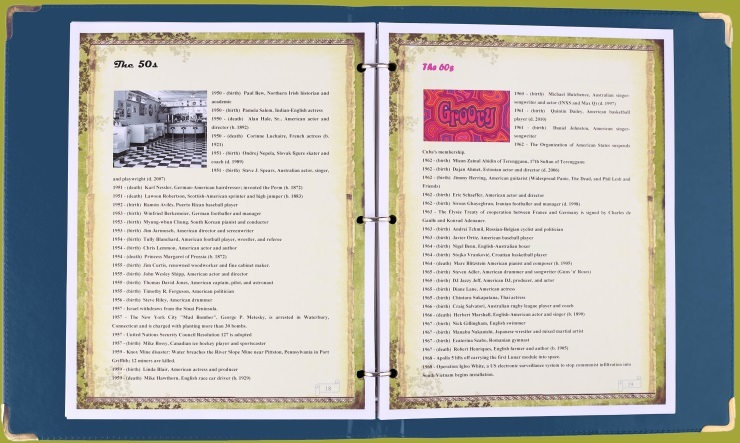 We offer co-branding in our Birthday Report For Employees! Note: if this is for a printed report, select where the report is shipping to. Thank you for your payment! Your transaction has been completed, and a receipt for your purchase has been emailed to you by paypal. You may log into your paypal account to view details of this transaction. Your digital birthday report will be emailed to the same email address that you provided to PayPal. Often we can get it done within 24 hours, but please allow up to 4 business days for electronic delivery of your report. The email will come from , please add this address to your safe list in your email client, or check your spam folder during the next few days in case the email was incorrectly labeled as spam. For printed reports, please allow an additional number of business days, depending on the shipping option that you chose. Your birthday report purchase has been canceled. Please contact us if you have any questions.